The Chinese believe there is a palace on the moon known as Guanghan Palace. It is home to the legendary figures Chang’e, the Jade Rabbit and Wu Gang the Woodcutter. According to Chinese mythology, they are responsible for the spots and shadows you see on the moon. On the roof of Moon Hill, you can see stalactites that greatly resemble these mythical characters. Perhaps they’ve become bored of the moon and decided to live on its beautiful earthly counterpart instead! Moon Hill is located just outside of Yangshuo and just south of the Jingbao River. At its summit, it reaches 380 metres (1,250 ft.) above sea level and is 410 metres (1,350 ft.) in length. 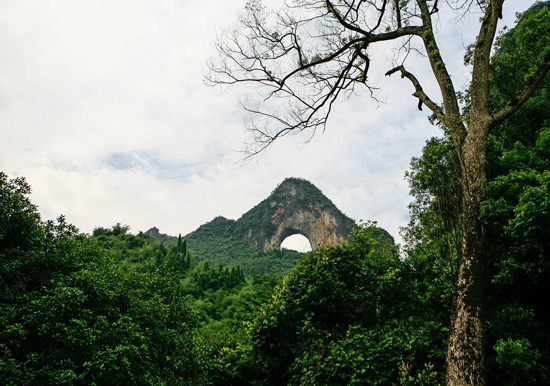 The “moon” of Moon Hill was once a cave that eroded over time to form a wide, semi-circular hole close to the summit. This hole, or arch, is 50 metres (about 160 ft.) high and approximately 50 metres wide. If you look at Moon Hill from different angles, it can appear to be a full moon or a crescent moon and, if you position yourself at exactly the right spot, you can make it look as though you are “holding” the moon in the palm of your hand. There is an 800-step path that leads to this arch and then a further, rockier path that leads to the mountain’s summit. The marble stairway was established in 1981 and is called “Appreciating Moon Path”. It is relatively easy to climb and takes approximately 20 minutes to reach the arch. The path leading to the summit is on a much higher gradient and is much more overgrown, so it can take another 20 minutes just to reach the top. However, whether you climb to the arch or brave the summit, the view from Moon Hill is truly spectacular. This vantage point offers you panoramic views of the surrounding countryside, and is the perfect place to take some stunning photographs of Yangshuo County. Moon Hill also boasts several rock-climbing routes of varying difficulties, most of which were pioneered by the American climber Todd Skinner in the 1990s. The mountain boasts over 14 climbing routes, among which the notorious “Moonwalker” is considered one of the most challenging. Moon Hill is within cycling distance of Yangshuo and, in an effort to promote tourism in the area, the government established a bicycle path there known as the Ten-Li Gallery. Li is a Chinese unit of measurement that roughly equates to half a kilometre (1,600 ft.) and along this ten li (50 km) path there are numerous mountains worth visiting. These mountains have been given fanciful names according to their shapes, such as the Flaming Mountain, the Heavenly Horse Gallops into the Sky, the Golden Cat Comes Out of the Hole, and the Beautiful Girl Puts on Her Make-up. 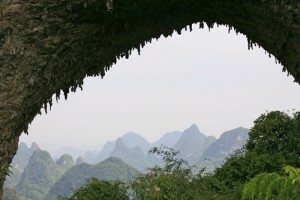 A series of caves, including Black Buddha Cave, Dragon Cave, and New Water Cave, have also been opened along the path to Moon Hill. Some of these caves even contain mud baths and hot springs where tourists can enjoy their own, private spa. There are two cycling routes from Yangshuo to Moon Hill. The older one tends to be full of vendors that will try to sell you snacks or souvenirs on your way. The newer one takes longer but is much quieter and takes you through the scenic, ancient village of Longtan or “Dragon Pond”. Longtan is located just behind Moon Hill and many of its houses are hundreds of years old. Walking through this rural town is like taking a trip back in time. The town derives its name from the pond directly behind it, which is also called Dragon Pond. This pond has been used by locals to wash their clothes and vegetables for hundreds of years.